DRIVING: Snow and ice can present major dangers on the road. Seniors should avoid driving when road conditions are at their worst due to snow and ice, and those who do drive should be prepared for the conditions. Drive slowly. Make sure snow-tires are installed when appropriate, and keep blankets and food in the car should the vehicle be stranded or disabled. HYPOTHERMIA and FROSTBITE: Cold temperatures can cause hypothermia and frostbite. 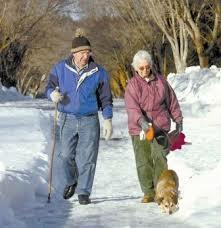 According to Centers for Disease Control, more than half of hypothermia deaths are among seniors. Older adults who do venture outside in cold weather should make sure to dress warmly. Among some vulnerable seniors, hypothermia can even occur indoors if the air temperature in the home isn’t warm enough, so seniors should keep their thermostats above 65 degrees, and seek assistance if they lose heating in an emergency. The very hazards that we outlined above can lead to seniors becoming socially isolated. If our older loved one has been spending a lot of time alone at home due to inclement weather, try to visit and spend extra time there. You can also arrange transportation to the local senior center, your loved one’s place of worship and to other places where opportunities to socialize are available. With winter comes the flu, which seniors are especially susceptible to developing because of weakened immune systems. The flu causes a significant number of fatalities among seniors each year, and it can also lead to secondary infections such as pneumonia. Seniors should make every reasonable effort to get vaccinated early in the flu season. Many people experience a decrease in mood and energy during the winter, which is caused by decreased daytime light in winter. This phenomenon is known as “seasonal affective disorder” or “SAD”. Those who live in northern states (where daytime is shorter) are at highest risk. Open curtains and blinds during winter to let natural lighting in. Light therapy, using full-spectrum lights available at many box stores, can also be used to prevent or alleviate the wintertime blues. Seniors experiencing depression should talk to their doctors. Seniors with Alzheimer’s and other forms of dementia sometimes experience sundowners syndrome, which manifests itself as increased memory loss, confusion, agitation, and even anger during the evening hours. Sundowning is often exacerbated during the low-light conditions of winter, because the season’s low light can disrupt our body’s internal day/night clock(known as circadian rhythms). COMMUNITY HOME CARE, a family owned and operated homecare agency, can provide a no cost/no obligation home visit and family meeting to help determine if your loved one requires in-home care. We offer a full range of services including transportation customized to meet each individual’s needs.